We are deeply saddened to learn of the loss of Officer Durman. The circumstances surrounding his loss are truly devastating. May he continue his watch in a better place. I am in each and every lovely thing. May God hold your loving wife and son in His arms in the days and months to come. Rest in peace, Brother, we'll take it from here. On behalf of the entire Colorado Springs Police Department Wives Association, we extend our deepest sympathies to the Lexington-Fayette Urban County Police Department, family and friends of Officer Durman. Our hearts are with you as you honor and mourn one of our nation's heroes. His service and sacrifice will never be forgotten. as a nurse, i have come to have the utmost respect for what the police do to keep us safe and how they always respond to the er when we call for help.Never asking why or failing to come when called. My heart breaks for your family and although I did not know you, you are a brother, a son, a father who will be missed and a brother in arms who cannot be replaced. May God receive you into his arms and comfort your family. Rest in peace Officer Durman, you and your family are in my thoughts and prayers. Thank you very much for your service! Our hearts are saddened as we mourn the loss of our brother, Officer Durman. May the hope of heaven grant peace to his family, friends and the members of the Lexington Police. Our prayers and support are with them as they stumble through this tragic time. God cups you close. Rest in peace, dear brother. We have the watch now. On behalf of all Missouri officers, dispatchers and the like I extend our sincere sympathies to the family, friends and co-workers of Officer Durman. Rest in peace our fallen hero. Your fellow officers did well laying you to rest today. I will be praying for your wife and beautiful son. Rest in peace. My heart goes out you all!!! 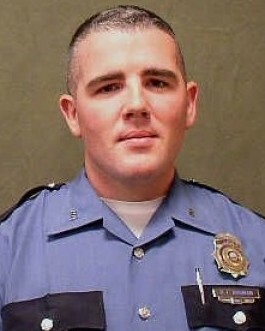 I am the sister of Officer Jason Cammack, KVE Officer killed in the Line of Duty on April 23, 2000. My family understands what you are going though on this very sad day. To his wife, and son please remember Bryan will always be with you in your hearts. He will be watching over you at all times. He will always be your guardian angel.I could set here all day and tell you the things that you will go though, but I won't. Just take one day at a time and always talk about him and keep his memeory alive. To his sisters and brothers, I truly understand Jason was my baby brother and even though it has been 10 years, I still remeber him every single day. I talk about him to people that didn't even know him and by the time I am finished they have an idea what a great person he was.This website has really helped me. I get on here and talk to Jason all the time. And to his Mom and Dad, I really can't understand what this is doing to you. I just know what my Mom and Dad go though everyday. God Bless you all and I love you all!!! I am sure you family knows that you are a true Hero. Thank you for your service and your ultimate sacrifice. You will always be remembered as our HERO. God Bless and Godspeed. Rest in peace, brother. May God be with the family of Officer Durman during this time of mourning. We've got the watch from here. Thank you for your service and sacrifice, it will never go unforgotten. Your Family, Friends and the Lexington-Fayette Urban County PD will be in my thoughts and prayers. Please accept the most heartfelt condolences for your loss from the men and women of the United States Border Patrol, Douglas, AZ station. We will not forget Officer Durman, and will continue in his stead, fighting evil in order to ensure a better world. When one of us falls, all of us stumble, but must carry on in honor and memory of the fallen. Officer Durman, call is Code-4. Rest in Peace, sir. We have it from here. Bless the family, friends and Department-Another senseless killing of a hero. May you somehow realize you knew a true hero, a man who only wanted to serve and protect. God Bless each Officer who puts on his badge each day having no idea what the day head holds. We citizens are so fortunate there are hero's not afraid to do what is asked of them. God Bless you all. Wanted to let Officer Durman's family know he was loved by his fellow officers who all consider themselves family to each other. When one is hurting, they all hurt. Officer Durman was a hero to all those he served and he will never be forgotten. Rest in peace Officer Durman. You will be missed. Our hearts and prayers go out to your family and friends in their time of sorrow. May God Bless and Rest in Peace!